West Yorkshire is offering some fab fireworks displays for 2018 this is your brill guide to all the wowing events taking place this Bonfire Night. If it’s a bonfire, a fireworks display or just a good old-fashioned get together, you will find a fun night. Time: Bonfire is lit at 6.30 pm, Main fireworks at 7.30 pm. Venue: Stourton Rd, Ilkley, LS29 9BG. What’s on Fireworks, BBQ, Pie, drink, Bar. Learn More: View Here about Ilkley Lawn Squash Club Fireworks event. Time: Gates open at 5:30 pm, finishes at 8:00 pm. Venue: Mirfield Showground, Huddersfield Rd, WF14 9NE. What’s on Fireworks, kids rides, food, drink, live music. Price: £4 adults, £1 under 13. Learn More: View Here about Mirfield Charity Bonfire & Fireworks event. Time: Gates open at 5:30 pm, Kids Fun at 6:00 pm, Fireworks at 7:15 pm. Venue: Newthorpe Lane, Newthorpe, LS25 5LX. What’s on: Hot Food, Drink, Fun, Pyro. Learn More: View Here about Squires Bonfire Night event. Time: Gates Open!, 5.30 pm – CF Display, 6.00 pm – Hellfyre Magpies – Dance Display Team, 6.10 pm – Lighting of the Bonfire, 6.30 pm – Main Firework Display, 7.15 pm. Venue: Hullen Edge Recreation Ground Elland. What’s on: 2 Firework Displays, Bonfire, Food Stalls, Hot Drinks & Cakes, Novelties & Sweets. Price: £5.00 Adults £2.50 Under 12s. Learn More: View Here about Elland Community Bonfire event. Time: Gates open at 17:00 pm, Bonfire is Lit at, 19:00 pm, Fireworks start around, 20:00 pm. Venue: Mercure Bradford Bankfield Hotel, Bradford Road, Bingley, BD16 1TU. What’s on: Fun entertainment, Fireworks, Bonfire. Learn More: View Here about Bonfire Night 2018 at the Mercure Bradford event. Time: Gates open at 5pm and a professional Firework Display by Optimum Fireworks will be from 6.45 pm. Venue:The Hive, Elliott Street, Slsden, West Yorkshire, BD20 9LT. What’s on: Family Fun, food and drinks, Fireworks. Price:Advance tickets for entry to the venue are £3 per person or £10 for a family of four. Learn More: View Here about Fireworks & Family Fun at The Hive event. For a safe fun night at any of these West Yorkshire Fireworks Displays Round Up 2018, Please follow the rules, as most displays do not allow to sell or buy fireworks or allow animals. Please take extra care if you are attending on your own, take the extra money and a mobile phone for emergencies only. Did you enjoy this post? Please share it with your friends. Would you like more? 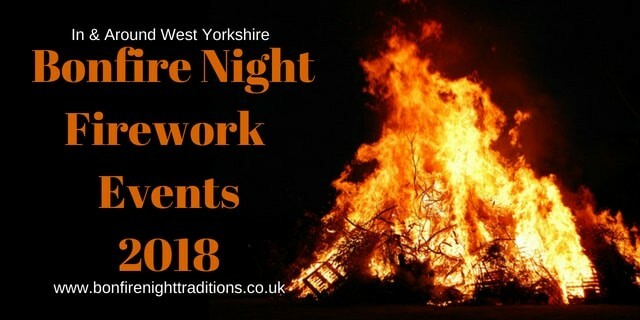 join us on the Bonfire Night Firework Displays in Yorkshire Facebook group. Where all the latest Yorkshire event are happening. Added – 1 event – 03/08/2018 – 18:00 pm. Added – 1 event – 03/09/2018 – 10:42 am.